Playing live is at the heart of Freddy's voodoo power; no two shows are the same. Their soulful slow burns and electro house jams have sold out gigs purely through word of mouth across the planet. Recent highlights include 2 sellout nights at the Roundhouse in London, Hammersmith Apollo, Le Zenith in Paris, Brixton Academy, Sonar Festival in Barcelona, Glastonbury Festival, WOMAD and the Detroit Music Festival. 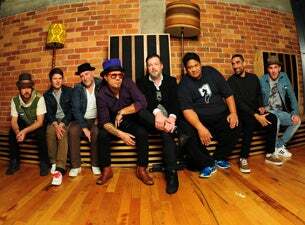 Freddy's independent attitude and indefinable music has won a legion of fans and respect since forming at the end of last century in Wellington, New Zealand. From launching their jam force in clubs around the Capital City, the band has stuck to an independent ethos through The Drop - their artist-operated label. Their latest album Dr Boondigga was two years in the making and comes four years since their debut album ‘Based On A True Story' rewrote musical history at home and abroad on its release in 2005. The rest is history as the independent release - a bed of mystic dub, soul and reggae - broke records at home and collected ‘Worldwide Album of The Year' from Gilles Petterson, going on to sell 200,000 copies. Fat Freddy's Drop stars Fitchie aka MU aka Chris Faiumu on MPC, Joe Dukie aka Dallas Tamaira on vocals and lyrics, Dobie Blaze aka Iain Gordon on Keys & Synth, Jetlag Johnson aka Tehimana Kerr on Guitar and the horn section of Tony Chang aka Toby Laing on trumpet with fellow jazz school graduates Hopepa aka Joe Lindsay on Trombone and Chopper Reedz aka Scott Towers on Saxophone.The band's name was inspired from Fat Freddy's Cat, a fictional feline in The Fabulous Furry Freak Brothers underground comic strip drawn by American cartoonist Gilbert Shelton in the seventies, though the expression was also apparently slang for a strong batch of LSD popular in Wellington in the nineties. "There were parallels with the cartoon characters, not just the way we looked," Fitchie says.